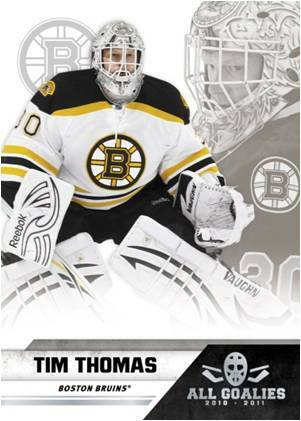 Hockey's goalie is one of the few position players in sports that has a dedicated group of collectors. 2010-11 Panini All-Rookie Hockey is being released as a 100-card boxed set that also includes five parallels and one memorabilia card. 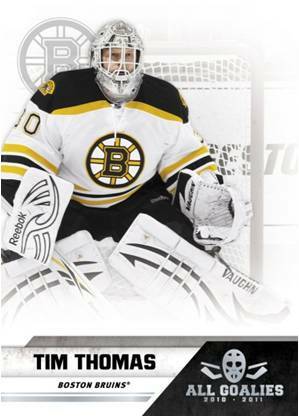 The 100-card checklist promises to include every goalie who saw minutes this season, including some who will be appearing on their first cards of the year. Also included are a handful of past stars such as Patrick Roy, Tom Barrasso and Ron Hextall. Entire set is dedicated to NHL goalies, past and present. Each box set includes five parallel cards that carry a distinctly different background. 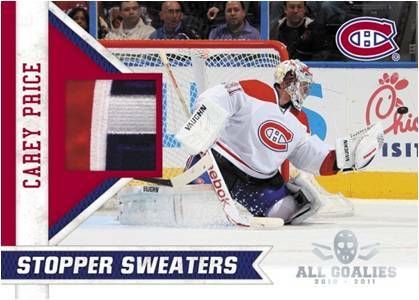 Stopper Sweaters: Inserted one per set, the memorabilia set mixes current stars, rookies and legends. 2010-11 Panini All Goalies Hockey Box Set - 1 Memorabilia Card Per Box! Very good set, for all goalie fanatics. Definitely recommended!